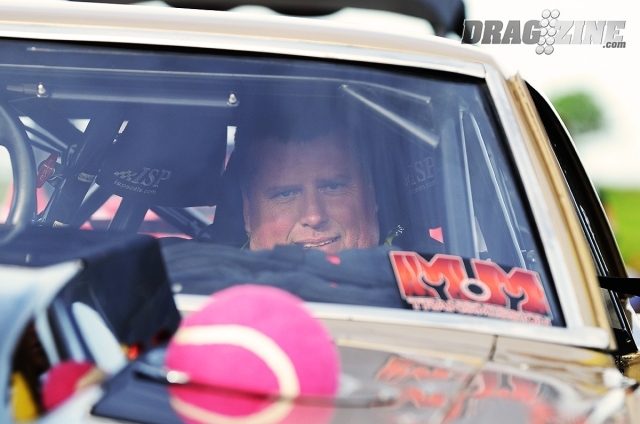 Earlier this year at the Tulsa Raceway’s Radial Revenge Tour, DeWayne “Big Daddy” Mills re-captured the quickest man on radials title with an epic, 4.08 second 1/8 mile. In case you were wondering, that’s a top speed of 194 miles per hour!!! The big-time performance, of course, came after a long back and forth between Mills and fellow driver, Jamie Hancock. For months, the two jockeyed between the record holding position with Hancock himself posting an astonishing 4.09 second time at the Shadyside Dragway just weeks prior. Making the record possible was Dewayne Mills’ “Golden Gorilla” ’68 Camaro (Golden Gorilla has got to be one of the greatest nicknames ever given, right?). This souped up Camaro features a twin-turbo’d ProLine Racing Engines 481X powerplant, capable of firing out 4,000-plus horsepower. In addition to that fiery engine, the car also features a Protorque converter, as well as tuning from Mills’ longtime friend and crew chief, Tim Davis. Despite the record breaking time, Mills- along with all of the other top name racers- are still battling to capture the elusive 4.00 mark, a milestone that has been taunting the racing community for years. Mills is confident about the pursuit, though. “All of us have the power to go 0’s. It’s just a matter of getting it to the ground,” Mills says. This entry was posted in Culture, Video and tagged 1/8 mile, 1968, breaking, camaro, dewayne mills, drag racing, golden gorilla, Radial Revenge Tour, record, Tulsa Raceway. Bookmark the permalink.